Jyrgalan – Boz-Uchuk Lakes’ trek. 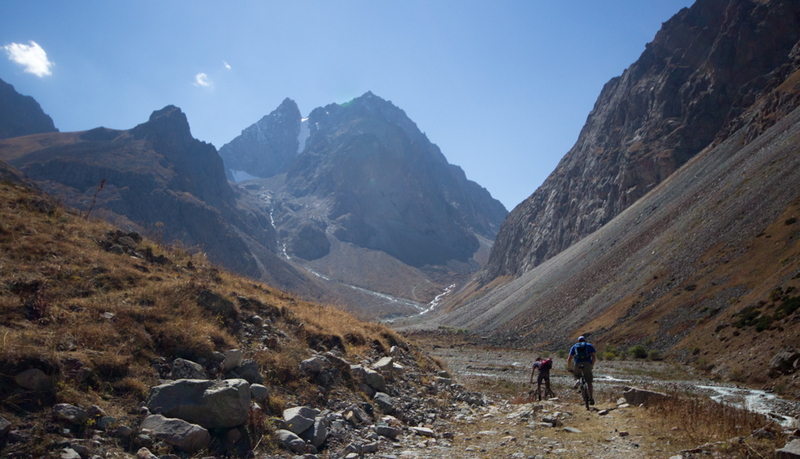 Kyrgyzstan is an excellent destination to get outdoors. 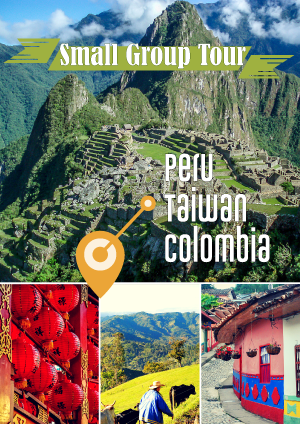 There are numerous ways and places for outdoor adventures including hiking, trekking, mountain climbing, horseback riding, swimming, whitewater rafting, skiing, cycling, and more. Think of a country filled with craggy mountains, green pastures, alpine meadows, and hundreds of lakes. 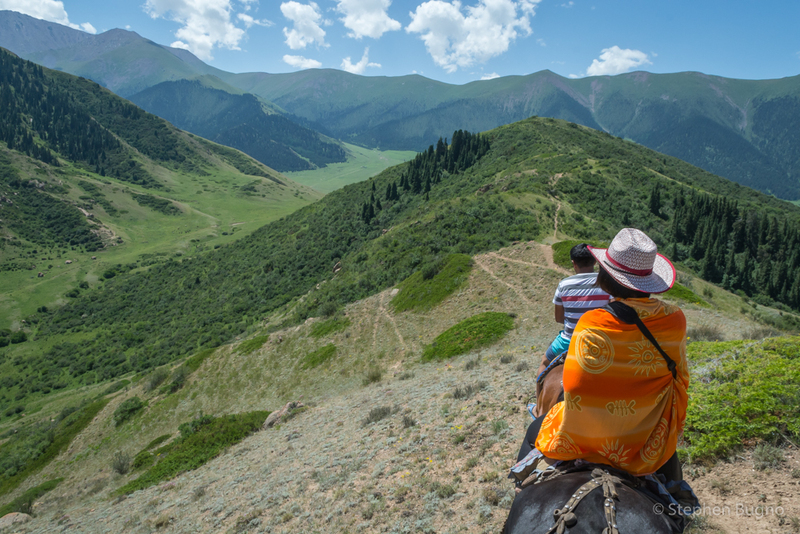 Then think of very hospitable semi-nomadic Kyrgyz people who make their summer homes up in the high-altitude pastures, many of whom welcome travelers and hikers to stay overnight or offer meals. It’s hard to find a better nature-culture 1-2 punch anywhere on the planet. In fact, we’re leading our very own trekking in Kyrgyzstan trip in late summer 2018. While we’re on the subject of best-ofs, I challenge you to find a better fresh water swimming experience in the world. 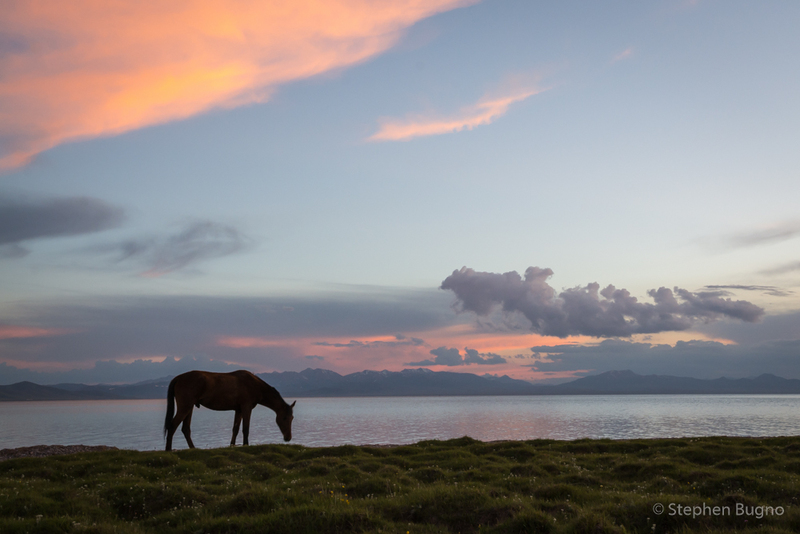 Issyk-Kul (Lake) is known as the second-biggest high-altitude lake in the world. But I think it’s the nicest. Surrounded by beautiful mountains, many of which are snow-capped, the natural atmosphere is hard to beat. The northern shore is more built up with a few small towns and resorts but the southern shore is more natural with only a few villages and yurt camps. Some parts of the shoreline are sandy while other parts consist of large pebbles. Along most of the shore the water is so clear you can see through several meters clearly. And in the warm Kyrgyz summers, the cool lake temperature is perfect. 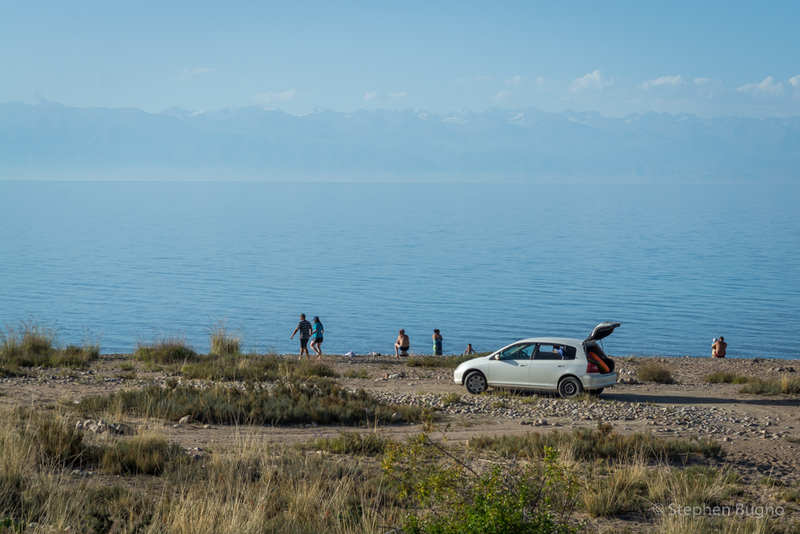 The most peculiar feature about Issyk-Kul, translated as “warm lake”, is that it, despite the cold winters and high elevation, does not freeze. If I lived locally, I’d take a summer beach vacation to Issyk-Kul. As a foreigner, I’ll have to settle for an occasional swim. In the hills of the Jalalabad region of western Kyrgyzstan are the famous walnut forests of Arslanbob. Here, a mostly ethnic Uzbek population harvest walnuts from the ancient groves and hosts travelers on the side. 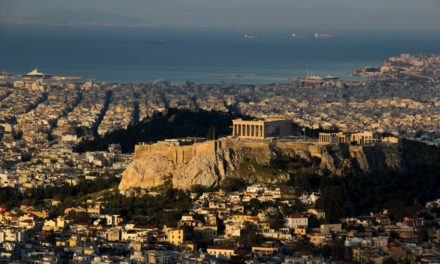 Actually, community-based tourism has become well-established here in recent years with a couple dozen families offering room and board for travelers. I visited several years ago and found the hospitality so pleasant that I end up staying a few days. I hiked every afternoon and enjoyed home-cooked meals in the morning and evening. And the views from these homes? Absolutely incredible. From the balcony of the house I stayed, there was an expansive view of the whole valley. 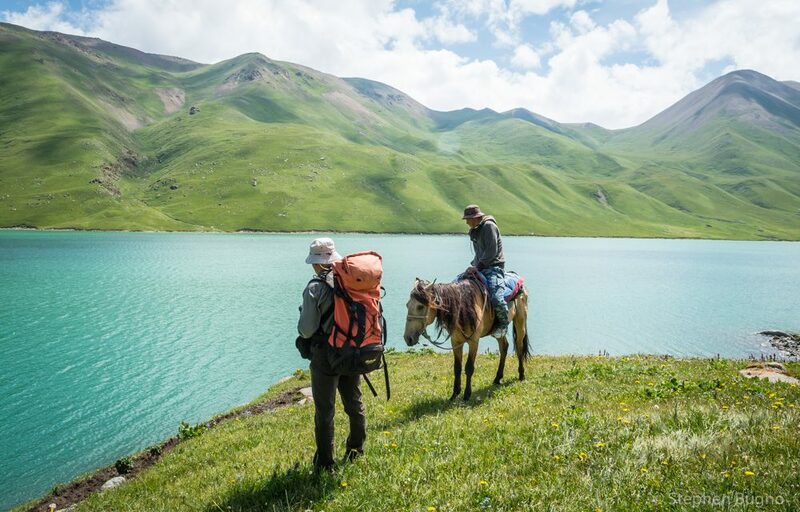 Recently, a number of smaller settlements around the south shore of Kyrgyzstan’s Issyk-Kol (lake) have been developing as alternative hubs for trekking on newly-marked routes into the central Tian Shan mountains. The small village of Jyrgalan, around 50 km to the east of Karakol is one of these and the starting point for the photogenic ‘Boz-Uchuk Lakes’ trek. This new eco-tourism destination offers trekking and horse riding during the summer months and free-ride backcountry skiing during winter. 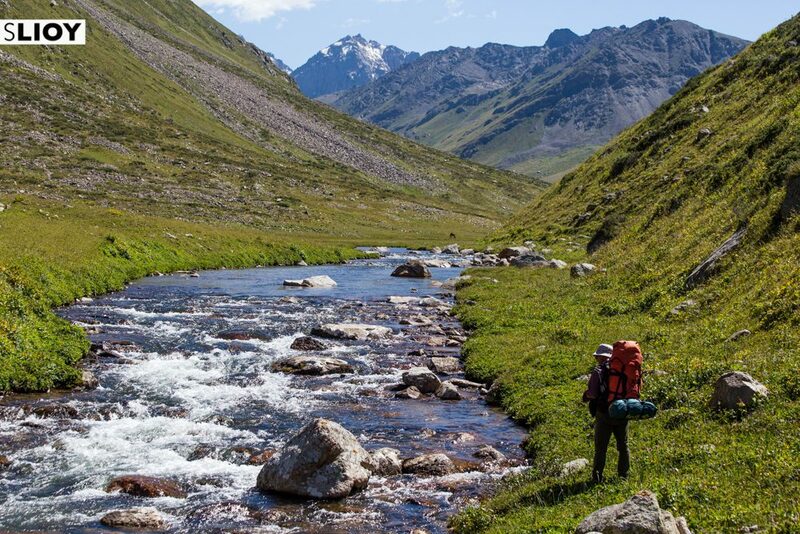 The Jyrgalan – Boz-Uchuk Lakes’ trek starts with a gentle climb up past yurt camps and jeep tracks alongside the Jyrgalan River before turning back southwest to trace the Terim Tor Bulak, a small tributary. Though the climb is tough, reaching over 3,000 m and then descending to the valley floor before another climb even higher, it is rewarding, with more yurt camps, towering mountain views, and on clear days layered rows of peaks that seem to stretch all the way to Khan-Tengri Peak and east to Kazakhstan. Ala-Archa National Park is your best option for getting outdoors from the capital, Bishkek. At only 40km, or an hour’s drive from the city, it’s a popular destination for weekend hikers, horse trekkers, skiers, as well as mountain climbers looking for challenging ice, rock, and mixed routes. From the main alpine base and hotels, paths lead onward to a Soviet-era ski base, glaciers, and waterfalls all within the Ala-Archa river valley. There are more than 20 small and large glaciers and at least 50 mountain peaks within the park. Wildlife here includes an abundance of trout, wild goats, roe deer, and marmots as well as the rarely seen snow leopard which roam on the alpine meadows and snowfields above 2,500 m. The park is open year-round, although the most popular season is late summer and early fall. 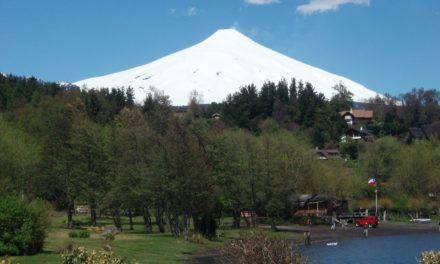 Every May 1, the Alpinada festival welcomes hundreds of adventurers to camp out in the valley and climb Mount Komsomolets. 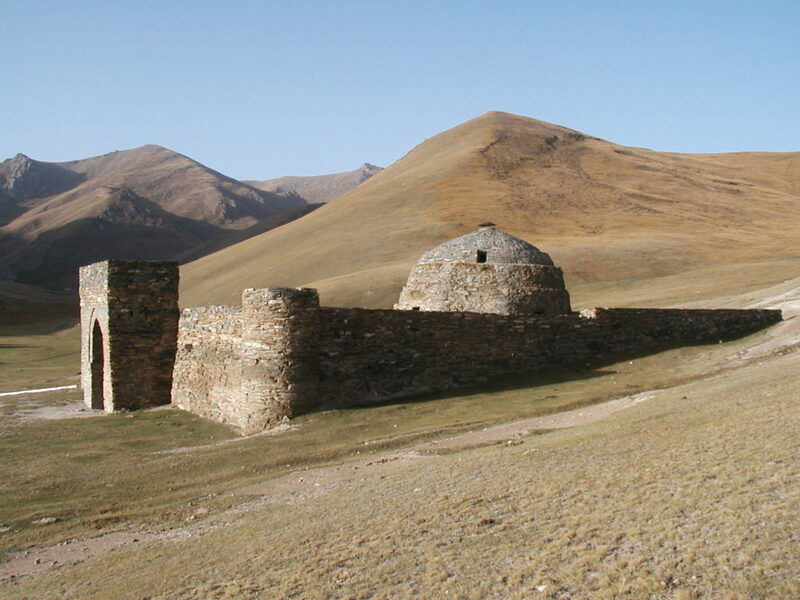 Tash Rabat Caravansarai is one of few old Silk Road relics that remain in Kyrgyzstan. Why is it included on this list of where to get outside in Kyrgyzstan? Because it’s located in the middle of nowhere, on the road south to the Torugart Pass to China. This old Silk Road Inn used to shelter traders and their animals along this remote stretch. Today there is a yurt camp nearby where you can spend the night while exploring the area. From there you can hike up to a pass which affords a tremendous view of Chatyr-Kul (Lake) and further on to China. 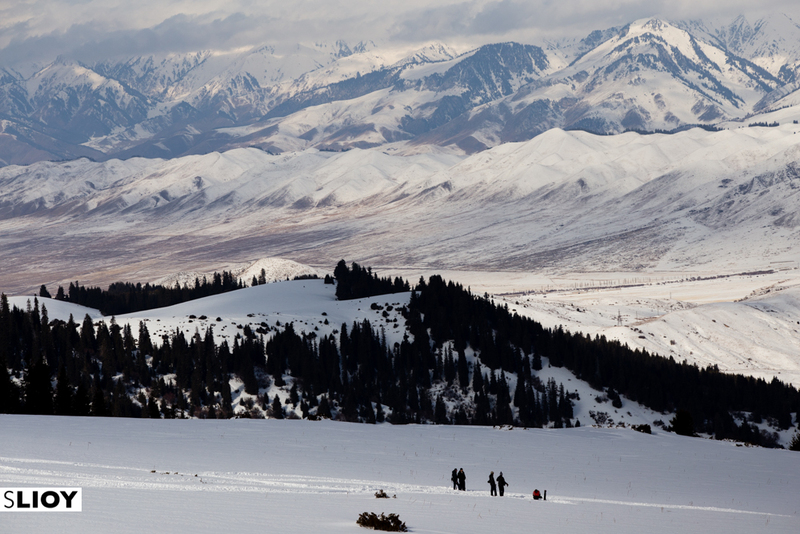 Kyrgyzstan has a growing downhill ski scene. The mountains are certainly epic, we know that. But over the past decade, Kyrgyzstan has been developing their winter sports infrastructure. There are resorts at Karakol and Jyrgalan and several mini ski bases that dot the hills surrounding Bishkek. In fact, Jyrgalan is the country’s first dedicated off-piste ski base, where skiers go for untouched powder. Skiing here is a great value compared to the western world – even at the most expensive ski base at Karakol, a lift pass is only about $17 US on weekends, and cheaper on weekdays. Another great reason to Ski Kyrgyzstan. Song-Kul is one of the most popular destinations in Kyrgyzstan. It is a high-altitude lake with no permanent dwellings. 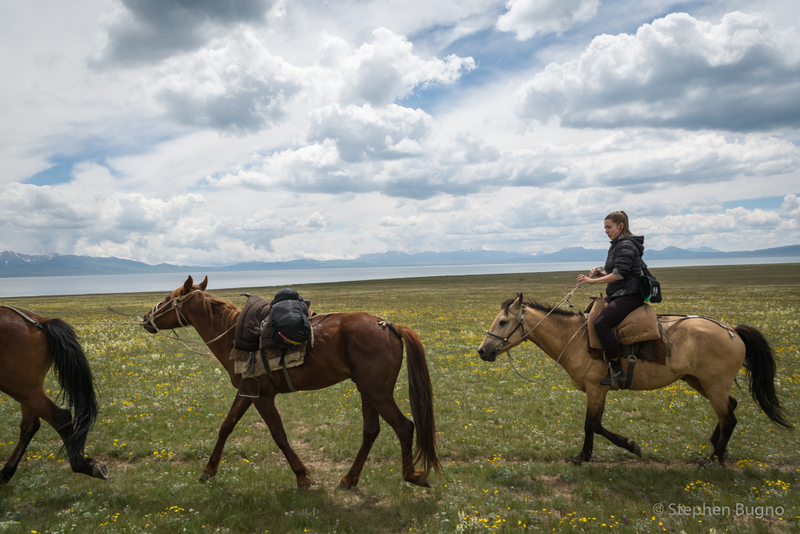 Most travelers make the trip as part of a two-day horse-trek but it’s also possible to hike in with a guide or independently. It’s assessable by 4-wheel drive but the unpaved road is challenging. CBT Kochkor has several yurt camps on the north shore but the southern shore is more serene. In summer there can be lots of tourists here and the surrounding valleys are dotted with the yurts of shepherding families. So there are numerous options to stop for lunch or accommodation along the way. Contact CBT in Kochkor to plan your trip or the Kubatov brothers of Mountain Explorer in Kochkor. 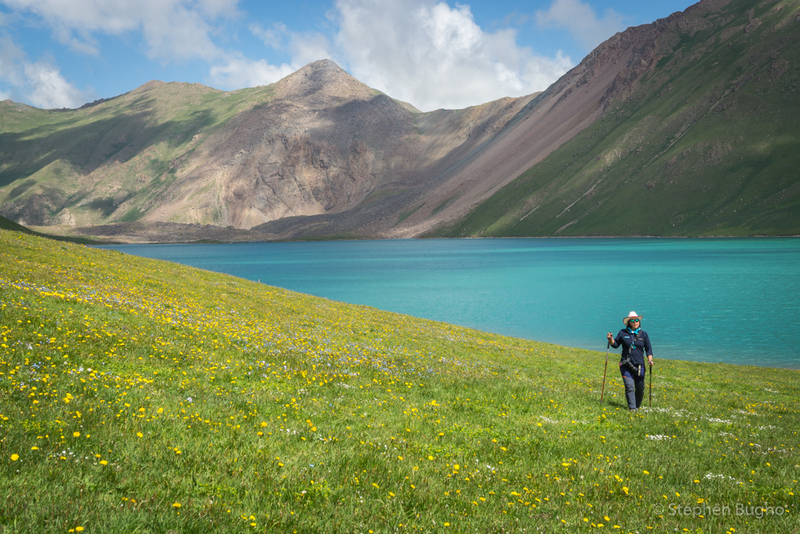 Our hike to Kol-Ukok turned out to be one of our favorite places in Kyrgyzstan. The hike starts just outside of Kochkor, in the village of Ak Kiya. A few hours up the gradual river valley you’ll reach a family with a couple yurts who put up hikers. Further up is the gorgeous blue-green Kol-Ukok (Lake). There are also shepherding families that live up here in the middle of the summer. From Kol-Ukok it is a steep 1.5-hour climb up to another, smaller glacial lake. Three days would allow a leisurely exploration of the area but 2.5 days would be adequate. You could also make an extended trek to Son-Kul from here. The Panorama (sometimes called Shatyly panorama) is a hilltop viewpoint high above Bokonbaeva on the southern shore of Issyk-Kul (Lake) that affords a stunning 360-degree view. It makes a great day trip and is accessible by foot or horseback. You can make arrangements at the Bokonbaeva CBT office or take a taxi to Bo Sal Kan where you start the hike or hire a horse and guide. From Bo Sal Kan it’s a 3km hike and takes about one hour. From Panorama you can see out onto the southern shore of Issyk Kul and behind, to the huge snow-capped peaks that rise above the eroded barren hills. There are a couple of yurts at Bo Sal Kan if you wish to stay overnight. But this can easily be done as a day trip if you’re staying in Bokonbaeva. The nature reserve southeast of Karakol is another excellent place to get outside. One of the most popular destinations here is a spartan hot-spring development called Altyn-Arashan. At an elevation of about 3000 m above sea-level, Altyn-Arashan is set in a picturesque alpine valley. A rough track winds its way up from the village of Ak-Suu, near Karakol. Most people hike up, but those with sturdy 4-wheel drive vehicles, not afraid of a little rough driving, attempt the drive. 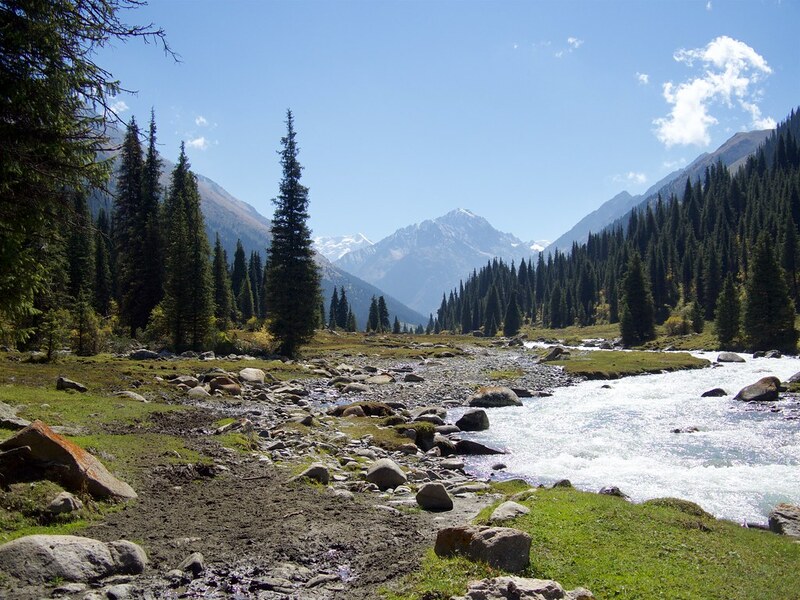 Altyn-Arashan is also part of a popular 3-4 day Ala-kol /Altyn-Arashan loop hike. If you start that trek from the entrance to the park just south of Karakol then you can hike up to Ala-kol and end with a soak in the hot springs at Altyn-Arashan. 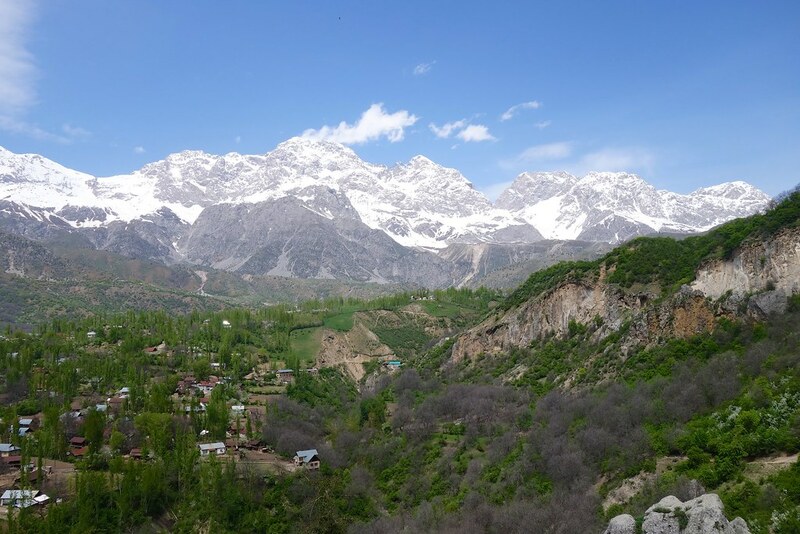 Or check out other options for trekking around Karakol.